Daredevil Yellow is Jeph Loeb and Tim Sale’s retelling of Daredevil’s origins. In an effort to deal with the loss of Karen Page, Matt writes a letter to her as a way of dealing with his feelings. Through these letters, we see his past. It was an entertaining story as a Daredevil fan, but I’m not sure it would work as a good introduction to the hero for people who weren’t familiar with him already. Then again, maybe an origin story isn’t always written for newcomers. Can’t a fan enjoy a retelling of an origin? The story centers on Karen Page. In addition, it covers the death of Matt’s father, Battling Jack Murdock, fairly well and gives a new (to me at least) reason for his costume being yellow; he made it out of his father’s robe. Loeb also gives motivation for Matt changing his costume to red based on feedback from Karen. That’s not exactly how I remember it from issue seven in which he mentions in passing redesigning his costume to make it “more comfortable” and “more distinctive.” User Aristocles on Answerbag wrote that the artist, Wally Wood, didn’t want the Man Without Fear to wear yellow because it’s the color of fear. Is it true? I don’t know, and I’m not researching. It sounds plausible though. The art style in Daredevil Yellow is a bit odd. It’s a bit deformed or grotesque. I don’t mean that in a bad way, but it’s just skewed. Usually this just seems like a stylistic choice, and it looks good on some characters. Matt looked good usually, for example. However, Karen looks like some sort of demon at times! I didn’t care for her look in most panels. Daredevil Yellow was entertaining but not superb. It worked at retelling parts of Matt’s origins but only parts. If you’re new to Daredevil, I wouldn’t recommend it. This entry was posted in Comics and tagged daredevil, jeph loeb, marvel, review, tim sale on June 28, 2013 by TheUser. Note: There aren’t really any huge plot twists to spoil in the movie, but I’ll be talking about the plot! I had a good time watching Man of Steel last week, but it wasn’t up to the quality of some other superhero movies. I enjoyed the Dark Knight trilogy and films in the Marvel Cinematic Universe (except Hulk) more. My exposure to Superman is limited primarily to the first season of Smallville, Superman for all Seasons, and the novel It’s Superman! First, there were many things I did like. Seeing Krypton was very interesting, and I’d love to see more of it in the future. I haven’t read much Superman, but I’m under the impression that not much is shown of Krypton in general. Just like my feelings about Asgard in Thor, I’d like to see a movie solely focused on Krypton. I also enjoyed seeing Clark Kent come to terms with his powers and who he is. His inner-conflict and relationships to other people were far more interesting that his battles. Everyone expects superhero stories to be full of fighting and action, and Man of Steel delivers that. However, they seem to go for too long. There are so many related conflicts back-to-back that it feels like a cliche RPG. After the last stage, you fight the boss, but then you fight the true boss. And then you fight the final form and then the hyper-final form. It wasn’t exactly like there, and there aren’t any huge twists; however there are a string of conflicts. My biggest problem with Man of Steel is that of Clark Kent’s secret identity. Multiple people know that Clark Kent is Superman and not people who are particularly close to him either. How could he keep his identity as Superman a secret? In addition, and here’s a bit of a spoiler, the military uses the ship in which he came to Earth near the end of the movie yet they don’t know who Superman is. How did they go to his house and pick it up while not knowing his identity? It seems silly. I’d also like to see him use his powers more. He uses x-ray vision and heightened senses as a child when he’s coming to terms with his powers, but he doesn’t use them during fights. He rarely even uses the heat vision. In fact, the abilities he uses in combat are limited to his super-strength, his ability to fly, and his invulnerability. It appears Superman deals with threats by throwing himself at them. I saw Man of Steel in 3D, although that was only because the 2D showing was a half hour later in the day. The film used 3D very well. It was never too “in-my-face,” and I use that term both figuratively and literally. It was subtle yet useful. Given that tickets for 3D films cost $4 more at the theater I attended, two tickets in 3D were $22 rather than the $14 they would have been in 2D. That’s not insignificant. The glasses are always a little annoying, sitting low on my nose in order to be worn with normal glasses, but I was glad they came in plastic and weren’t scratched. Despite some drawbacks, I enjoyed the movie. I’d watch a sequel and would particularly like to see a DC Cinematic Universe like Marvel’s. Given how this movie already goes through his origin story and made me excited about Superman, I think I should go watch Smallville instead of waiting for another movie! This entry was posted in Comics, Movies and tagged batman, clark kent, dc, dc cinematic universe, man of steel, marvel, marvel cinematic universe, superman, the dark knight on June 26, 2013 by TheUser. Having recently finished Journey to the Center of the Earth, I can say that it’s fairly entertaining once the characters get somewhere interesting! For the first section of the book, which felt like roughly a third of it, the explorers were simply traveling to the point at which they were going to begin their descent into the Earth. Following that section, they begin their descent through an inactive volcano, hiking down tunnels. This part as well drags for quite some time. Truly it’s only the final third or so of the book that deals with interesting discoveries, and once I reached that part, the rate at which I read greatly increased. There’s something about an underground world that seems strangely exciting. We see it over and over in literature and other media. Reading this novel continually made me want to play Dungeons & Dragons. I can’t say exactly why, because I’ve never played in a campaign that featured much underground exploration. The choice of narrator in the novel is particularly useful in framing the story in a context that’s sympathetic to the reader. While Axel’s uncle, Professor Lidenbrock, continually believes in the validity of their journey and never waivers, Axel questions it constantly. He believes in the accepted science and doesn’t think they’ll succeed. There are times that he flips his feelings and gets excited, but he’s still the voice of the current knowledge and status quo. It took me a while to finish the novel, but I’m glad I did. I probably won’t be reading more Jules Verne immediately, but I’d be happy to read some of his other novels in the future. This entry was posted in Books and Literature and tagged journey to the center of the earth, jules verne, sci-fi, science fiction on June 25, 2013 by TheUser. Did I mention that Jackie visited recently? I did briefly when I talked about Puppet Mayhem, but now I have this photo to share! 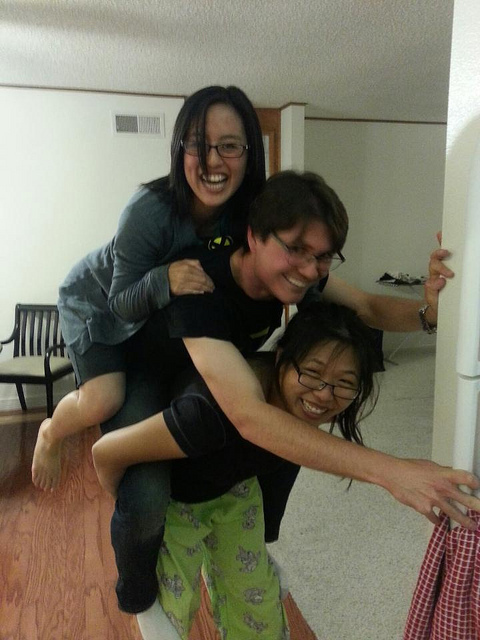 This, my friends, is a double-piggyback ride. It was gem’s idea, so don’t yell at us for abusing her. It was a lot of fun hanging out with her! It made me nostalgic for the time spent in college. Oh well. Things change. She was only around for a day, but I think we made the most of it. Her sister graduated, so Jackie was in town for the graduation. Afterward, she hung out with us and stayed at gem’s house before flying home in the morning. This entry was posted in Journal, Photos and Screenshots and tagged double-piggyback, jackie, piggyback on June 24, 2013 by TheUser. On Saturday we continued celebrating Darnell and Alex’s return to California and Lorena’s imminent three-month trip to Alaska by going on a duffy boat and then out for drinks in Newport! 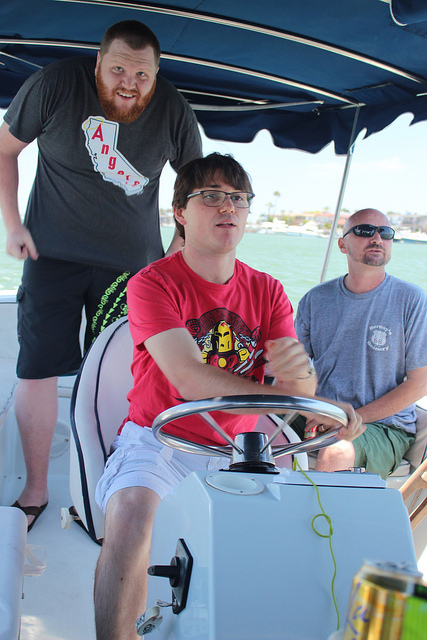 For most of the time that we were on the water, Jon piloted the boat, but some of us took turns as well. We had drinks, cheese, crackers, fruits, and good conversation! gem made a great boat captain too of course! Gracie may have freaked out a little when she was in charge. Just a little though. Maybe. Here I am hard at work with Jon and Devin helping. Darnell was willing to pose, but I guess Alex was too busy looking over there to even care. Here’s another great shot of Darnell! We even had a buddy come join us on the duffy. He hung out for quite some time. After our time with the boat came to an end, we went out for drinks and dinner. We started with a drink at A Restaurant. It was a quiet, warm-feeling place. It was a nice place to talk, but the prices were a little high. After that we headed to the Rusty Pelican, where we stayed for a while. (The calamari was excellent!) When the hunger hit hard, we walked to DivBar Smokehouse Barbecue, where I had the brisket with baked beans. Delicious. After dinner we headed back to the Rusty Pelican to enjoy some live music. By the time I was getting pretty tired. I had a glass of Moscato and read Journey to the Center of the Earth while listening to the music. Is that rude? Yeah, it’s probably rude, but honestly I enjoy reading while listening to live music. The day was packed with fun with great people, but I’ll admit, I was pretty tired that evening! This entry was posted in Journal, Photos and Screenshots and tagged a restaurant, boat, divbar, duffy boat, journal, newport beach, the rusty pelican on June 23, 2013 by TheUser. How could you go wrong with a manga about a boxing penguin who’s in love with a high school girl? You can’t of course. I’m pretty sure I picked up Tuxedo Gin Vol. 1 years ago at Anime Expo. I bought a bunch of volumes 1 of things so I could try different mangas. My logic was a little peculiar I suppose. However, I just got around to reading this. Ginji, a young man just breaking into professional boxing meets a girl, Minako, falls in love with her, and then gets killed – a tale as old as time. A guardian angel gives him a chance to be put back into his body, but he has to first live through a reincarnation as a penguin, Gin, and he can’t try to kill himself as a penguin either. Luckily for him, he winds up with Minako, and she loves penguins. From there it pans out like you’d expect if you read manga or watch anime: there are some awkward scenes as she reveals herself in front of the Gin. Better yet, Gin puts his boxing skills to the test as a penguin. It’s funny in a stereotypical way, although usually in this type of story there’s the lingering chance that the girl will reciprocate feelings. That can’t really happen with Gin a penguin. In addition, some of the panels are a little hard to understand graphically. I’ll be reading a little more I think but won’t make it a priority. This entry was posted in Anime and Manga, Comics and tagged manga, tokihiko matsuura, tuxedo gin on June 20, 2013 by TheUser. This soup has amazing powers. Just look at the description. “This will make you feel better when you’re sick!” It’s comforting, but I had some last night and I’m still sick unfortunately. I guess I just need more. This entry was posted in Food, Journal and tagged chicken, hot dogs, recipe, sick, soup on June 19, 2013 by TheUser. I received tickets to Man of Steel because of a partnership with Norton for last Wednesday night, two days before the movie was actually was released. I had plans that night, but I figured that they’d be easy to give away, right? Not so much. My friends who really love Superman wouldn’t be off work in time. My co-worker whose birthday was the same day had plans despite wanting to see it. My step-dad didn’t want them with my mom out of town. In all, I asked ten people (counting a couple as one) before I found someone who wanted them. It was short notice, which is what made it difficult. I know a lot of people would have been interested if I had received the tickets and started looking earlier. Eventually I found that my friend Mario wanted tickets. Giving them to him would ensure they get used, make me a good friend, and get me some cred with my DM, right? He took them, but as it turns out, he couldn’t go. However, everything ends well. His wife and daughter took advantage of them! I guess she’s a big fan of Superman, so I’m glad she enjoyed the tickets. Mario said that she said there were aspects of the movie that disappointed her, but I’m not sure what those are. That’s too bad, but it also seems normal given that she’s a fan. This entry was posted in Comics, Journal, Movies and tagged dc, man of steel, norton, superman on June 17, 2013 by TheUser. Today we went to a birthday party for gem’s newphew, Jonah. It was a lot of fun, but as usual at her family parties, I ate way too much. Cooking skill must run in the family! 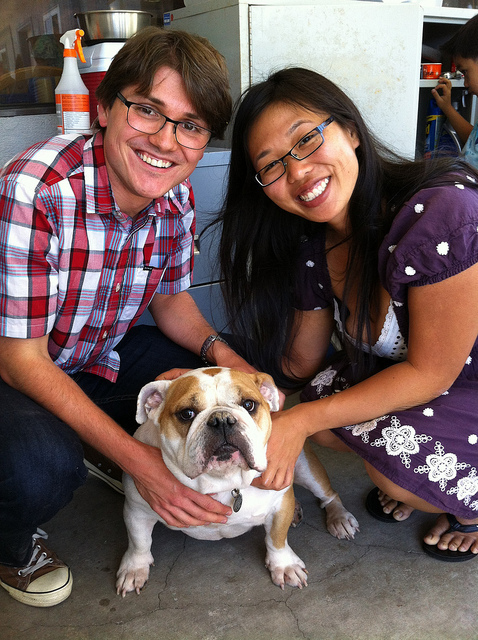 We also got to play with this awesome dog. I believe her name was Nala. At one point she got in the house, and when they tried to get her to leave, she flattened out and refused to budge. Adorable. After the party I stopped by Shaun’s place. He’s moving to Australia soon and was giving away some of this belongings. He gave me some dumbbells and the collector’s edition of The Burning Crusade. We stayed for a while and chatted, which was nice since I hadn’t seen him in a while. It takes a lot of courage and initiative to make such a big life-changing choice like moving to a new country. I hope it works out well for him! After Shaun’s it was off to my dad’s house. He seems to be doing well, and I’m glad I got to talk to him on Father’s Day. We almost always argue about huge personal philosophies, politics, and the economy, but it’s nice that he gives me a point of view that’s often hard to see. On the way back to the car, I met a woman who asked for help a box out of her truck. She and another woman had purchased a new shed and needed to carry into the backyard. I helped them get it moved and talked for a bit. They were both very nice and offered me a ride if I needed and money for my help, both of which I declined. I didn’t want to take their money, and I didn’t actually need the ride. Although I feel exhausted right now for some reason, it was a very nice day. This entry was posted in Animals, Journal, Photos and Screenshots and tagged australia, dogs, family, father's day, party on June 16, 2013 by TheUser.